The greeNWAy initiative is an education and recognition program to connect people, sustain profits and preserve the planet for the businesses in Northwest Arkansas. During a Fayetteville Community Summit in 2009, community members discussed the need for a local green business certification. The Fayetteville Chamber recognized the prevalent support for such a program, and thus, the greeNWAy Initiative was created. The Fayetteville Chamber launched the program in 2010 with five pilot organizations - the City of Fayetteville, the Fayetteville Chamber of Commerce, Salon Professionals, Clubhaus Fitness, and Courtyard Marriott. 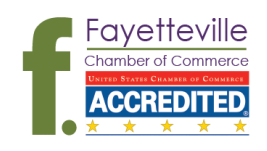 The program has experienced much success, and since 2010, the Fayetteville Chamber has certified 36 businesses to become greeNWAy certified. The entire process usually take 2-4 weeks. First, we'll meet with you to see if you find our program a right fit for your business then you'll meet with our GreeNWAy coordinator for the next steps. What is the cost of certification and how long is it valid? Our cost schedule is based on a sliding scale according to the number of full-time equivalent employees. For example, for 1-9 FTEs, the cost is $50 and certification is valid for two years. What financial incentives are there to assist businesses in "going green"? We are constantly searching for rebates and tax incentives for rebates on both structural implementations, equipment purchases, etc. Join our program for email updates on these sustainability-related financial incentives for your business. Business of all sizes are encouraged to apply for our program, with the exception of home-based businesses due to the difference in energy rebates and laws. Please contact Taylor Shelton at the Fayetteville Chamber at tshelton@fayettevillear.com or 479-521-1710.